Montpelier's African American Descendants' Project seeks to identify and create bridges to living descendants of the African American women and men who were enslaved at Montpelier and elsewhere in Orange County, Virginia. Beyond this, Montpelier researchers and scholars wish to expand the local, regional, and national African American community whose members identify and connect with the history of James Madison's Montpelier. The Descendants’ Project works with the Montpelier Research Department on documentary research regarding the enslaved community at Montpelier and the surrounding areas during the Madison ownership. In addition, the Archaeology department engages with members of the Descendants’ Community in annual excavation programs called Expeditions. These groups also provide essential advice on, and collaboration with, our programs to interpret African American history. 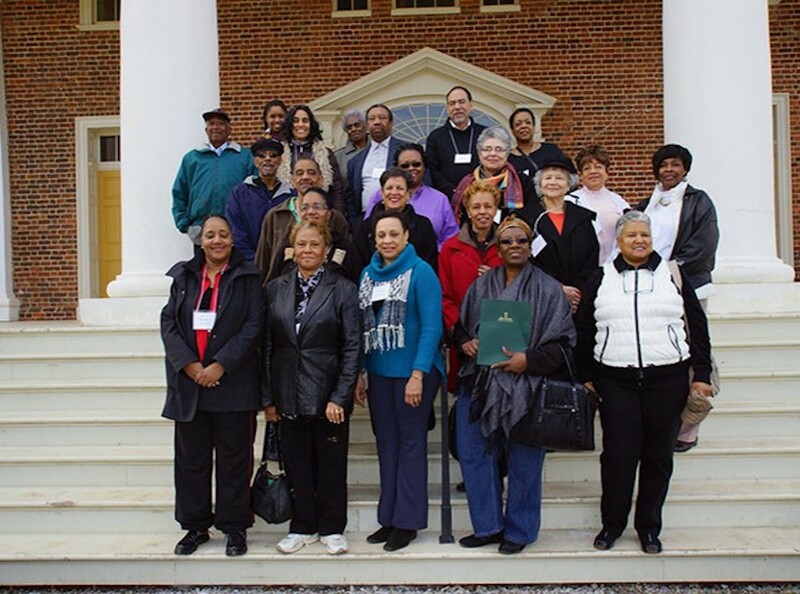 Montpelier Broadens Definition of "Descendant"
Since the early 2000s, the Montpelier Descendant community has grown into a large stakeholder group of people who are interested in, and feel connected to, African American history at Montpelier, regardless of personal ancestry. For many African American families, documentary evidence prior to the 1870 census is scarce or non-existent, making it challenging to trace connections between enslaved people and their descendants. Additionally, the world of enslaved people did not conform to the boundaries of white-owned plantations, since family members often lived, both in slavery and freedom, on neighboring estates or even further afield. White slave holders rarely recognized or recorded African American surnames. Years of work by Montpelier researchers have identified by name nearly 300 individuals enslaved by four generations of Madisons, including thirteen with surnames: Adams, Bolen, Gardener, Gilmore, Freeman, Jennings, McDaniel, Payne, Shepherd, Stewart, Taliaferro, Taylor, and Walker. Many more are yet to be uncovered. Since 2000, Montpelier has undertaken focused genealogical research that aims to connect the named enslaved individuals from the historical record to present-day descendants and their family histories, both oral and documentary. Using sources ranging from court records and census material to letters and family anecdotes, we are actively tracing and analyzing the stories of the seven generations of men, women, and children who lived and worked in slavery at Montpelier. This research may one day uncover the post-emancipation experiences of the descendants of Caty Taylor, an enslaved domestic servant; Aleck, a wagoner; Harriet, a weaver; Simon, a butler; and Moses, a blacksmith. The project will also contextualize slave resistance at Montpelier and in Washington through the stories of the escapes of Anthony and Ellen Stewart and the sale of Billey. Through these efforts, we aim to shed light on individual lives and achievements. Archaeology provides another essential method for studying slavery. Excavations of areas where enslaved families lived and worked provides evidence forthe material world of slavery. Archaeology reveals the size and nature of dwellings and work buildings and the physical remains of the possessions of enslaved men, women, and children. These include glass, ceramic, and metal tablewares and other household goods; buttons, buckles, beads and other aspects of clothing and personal adornment; items used for self care like combs and toothbrushes; fragments of tools, cooking utensils, sewing equipment, and even items like crystals that reveal spiritual beliefs and practices. Montpelier's nationally-recognized public archaeology program hosts an annual program for members of the Descendant Community to connect with the material history of their ancestors by participating in an archaeological excavation. Recovering the personal household items that enslaved men and women bought and used provides an intimate, tangible connection with the past. Montpelier is committed to including the Descendant Community in archaeological programs as a way to help connect the descendants with the material history of their ancestors. The collaboration between archaeologists and members of the Descendant Community at archaeology sites and in the lab has resulted in new insights and connections. Many descendants were initially surprised to realize their enslaved ancestors actually purchased their own household items, using cash or barter from items they produced in their own gardens or spare time. In turn, archaeologists learned the connection between spiritual beliefs and material goods that are still remembered in African American families today. 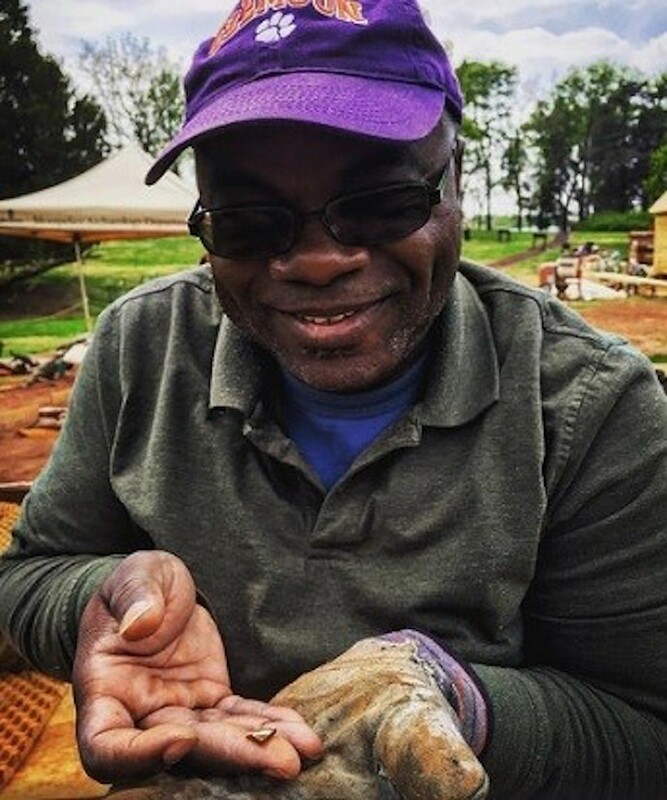 A tangible connection between spiritual beliefs and archaeologically recovered items came home with the discovery of a quartz crystal near the collapsed foundation for one of the slave quarters. Descendants noted the traditional placement of white or shiny objects in the corner of rooms as bringing good luck or keeping away malevolent spirits. Recognizing the importance of this crystal, descendants ceremonially placed a representative crystal in a corner footer during the reconstruction of this building. Descendants also noted the importance of yard sweeping. During a lecture where archaeologists discussed how the yards around slave quarters would be kept free of debris (as seen through distributions of archaeological objects), several participants remembered that their grandparents required them as children to sweep the yards. When they complained about such tasks, their elders told them that sweeping is how you make a yard part of the home. These collaborative discussions and observations provided insights that would be lost without the descendant connection. In the process, descendants could see the impact they had on the interpretations archaeologists were making about their ancestors homes. Taking part in the discovery process took both a tangible dimension through unearthing artifacts and an intellectual dimension through discussing the importance these objects represented in the everyday lives of slaves. This shared research and discovery gave descendants an investment in the final product of restoration and archaeologists the realization that descendants had critical insights into making the past come alive.